Graphing a linear inequality is just an extension of graphing a straight line! An inequality written in the form Ax + By < C (where A and B are not zero), is called a linear inequality in two variables. • Isolate y to one side of the inequality (if necessary). 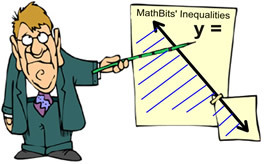 • Replace the inequality symbol with an = sign to create an equation. • Draw the line dashed if you have a "strict" inequality (less than or greater than). • Draw the line solid if the inequality is less than or equal to or greater than or equal to. • Choose a point not on the line as a test point. 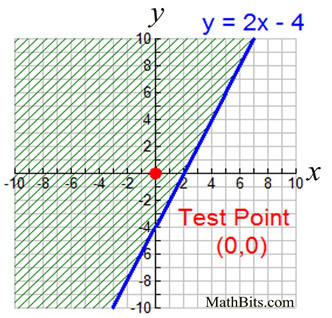 The point (0,0) is an easy point to test, as long as it is not on the line. The test point will lie in one of the half-planes formed by the boundary line. • If the test point makes the inequality true, shade that side of the line (shading over the point). If the test point makes the inequality false, shade the other side of the line (not shading over the point). 1. The inequality already has y isolated. 2. Graph the straight line y = 2x - 4. The line is drawn solid since the inequality is greater than or equal to. 3. Pick a test point not on the line. The point (0,0) was used in this example. 5. The test point gave a true result, so the graph is shaded on that side of the line (so that the shade will cover the test point). 1. Isolate the y value. Divide all terms by 4. 2. Graph the straight line y = -½ x - 3. The line is drawn dashed since this is a strict inequality (less than). 5. The test point gave a false result, so the graph is shaded on other side of the line (so that the shade will NOT cover the test point). plane (a "half-plane") bounded by a straight line. TI-83+ graphing calculator to graph linear inequalities.